It's all neat and tidy too. Gone is the pile of HiFi components and wires in the living room. Gone are the shelves of CD's. All your music is stored, in its original quality, on a compact server hidden away in a cupboard. You can have discrete in-wall or ceiling speakers in most rooms with the option of more traditional loudspeakers for the main listening room. Control it all via handheld remotes, in-wall panels, a dektop/laptop computer or your mobile phone. When installed alongside a home management system, your audio system can be integrated with other stuff. 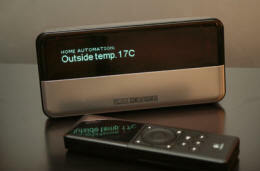 The picture above shows a Logitec SlimPlayer using custom software written by ersp-design to show information from a house weather station. Other information such as caller-ID and entry phone indication can also be displayed. Useful for us that like to crank it up. ersp-design offers a complete range of services for whole-house and multi-room audio. Pick any or all of requirements analysis, system selection, design, installation and user training. We can also help you load your existing content from CD. We can even transfer any rare, cherished vinyl onto your system with full restoration, artwork and meta-data.